Bridgeport is Still Kicking out Some Very Nice Fish! 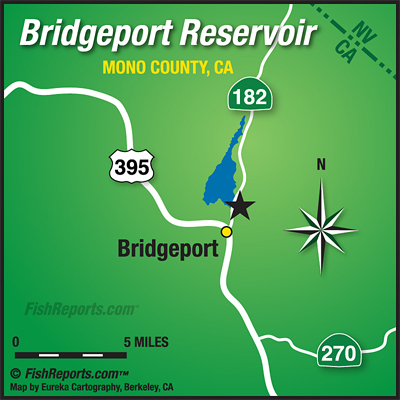 Bridgeport is still kicking out some very nice fish, several over 7 pounds over the last couple days. There have been a couple slow days this week but for the most part the fishing has been holding up pretty good. The best areas to fish have been up in the channels in Buckeye Bay, some good reports from the East Walker channel and still a few fish being caught off of Rainbow Point. We have also talked to a couple anglers who were able to have some good action trolling in the Rainbow Point area all the way over to Paradise Shores, there are some weeds to contend with but they said it wasn’t too bad and they were able to get into quite a few fish up to around 4 pounds. Trollers are using crawlers, thomas bouyants, speedy shiners and small rapalas. Bait anglers are going with power bait, pinched crawlers, inflated crawlers and mice tails. Fly anglers are using damsel nymphs, blood midge patterns, soft hackles, ice cream cones, black beauty’s and the like and doing very well.